Offering better premium pricing to employees who pass through a “gate” is one of several new strategies for controlling health costs. 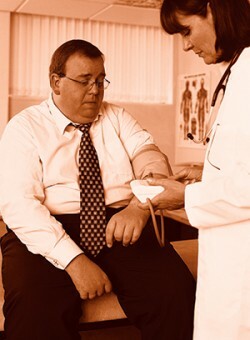 Should employees who smoke, have a high body mass index, or fail to follow doctors’ orders for managing diabetes pay more for their health benefits than their peers with healthier lifestyles do? For a growing number of finance chiefs, the answer is yes. Steven Shaffer is one of them. When he arrived at Maplewood Senior Living earlier this year for a five-month stint as interim CFO, he was disappointed to find that he couldn’t immediately implement his favorite health-cost-mitigation strategy at the $70 million, 750-employee operator of assisted living facilities. The strategy involves tiering employees’ health benefits based on the healthfulness, or lack thereof, of their lifestyles. Because of timing issues, Maplewood wouldn’t be able to implement a tiered strategy until 2015. But Shaffer says a similar approach delivered savings at his two previous jobs, as finance chief for Atrium Health Group, a provider of rehabilitative programs; and as vice president of U.S. financial reporting for Revera Health Systems, a global senior-living provider with 30,000 employees. Shaffer’s strategy is a fairly extreme version of what some call gating, where employees have to perform some task or otherwise qualify to receive premium benefits. But other strategies are making waves, too. Price caps on services (so-called reference-based pricing) and “unitized” pricing are starting to attract interest from companies seeking to keep a lid on health care costs. Consumer-directed health plans, already offered by many companies as an alternative cost-saving vehicle, are increasingly the only plan offered. Together, these and other strategies are changing the face of corporate health care. Robert Calise, a principal and founding partner of Cornerstone Group, a health benefits consultancy and broker that has helped Shaffer implement the tiered programs, says interest in gating has risen sharply over the past couple of years. Most of the activity has been at companies with more than 5,000 employees, but now it’s starting to trickle down the size scale, he says. About 25% of Cornerstone’s employer clients are now tiering their benefits based on lifestyle factors, according to Calise. Shaffer says it took Revera, his employer for six years until 2013, three years to roll out the tiering arrangement. In the first year, employees who said they didn’t smoke were taken at their word. Swabs were taken in the second year, but the differences in premiums for healthy and unhealthy lifestyles remained modest. In the third year, however, employees with several unhealthy factors were required to pay as much as 75% of the overall health insurance premium. A more mainstream example of gating is in place at Wenger, a $100 million maker of equipment for music education and performance. Employees can choose between a high-deductible plan tied to a health savings account (HSA) and a traditional PPO plan, but both have preferred and nonpreferred premium rates. To get the better pricing, an employee must have an annual health screening and accumulate 60 points by participating in several activities. Points are awarded for things like using a cost-comparison tool for health services, taking part in a local walking initiative, using gyms, and visiting a farmer’s market. Wenger’s program has been expanding since Joe McCusker came on board as CFO in October 2013. While the company had been focused on healthy behaviors, he’s added elements that encourage employees to be more aware of health care costs. For example, points are awarded for merely using the cost-comparison tool, even if workers have no current health issues to address. “It teaches them to be more aware of the cost variations that are out there, and they’ll know how to use the tool when the time comes that it’s applicable,” McCusker says. The tool can compare, for example, the price of a prescription filled via mail versus the price at a retail pharmacy, or the costs of an X-ray at a clinic and at a hospital. Gating strategies are practiced at 20% of employers today, according to a recent Aon Hewitt survey of 1,234 HR leaders at large companies. But 60% of respondents say they will adopt gating within three to five years. With many companies implementing high-deductible plans, in some cases as the only option available, gating gives employees expanded choice. In reference-based pricing, price caps are set for certain health care services whose cost, but not quality, varies considerably from provider to provider. Employees who want to use a more expensive provider for such services must pay the difference. While only 10% of respondents to Aon Hewitt’s survey say their companies currently use reference-based pricing, 68% expect to adopt the cost-control strategy within five years. McCusker has been frustrated that none of the three major insurance carriers covering southeastern Minnesota, where Wenger is based, accommodates reference-based pricing, although one of the carriers is currently conducting a pilot program with a local employer. It’s a particularly urgent need for Wenger, given its location. • Adopting unitized pricing, where employee contributions are based on the total number of dependents, rather than offering a “family” plan at one rate (5% versus 52%). Of course, it may be human nature to give affirmative answers to such future-looking questions. Winkler acknowledges as much but insists that there is good reason to believe such strategies will be commonplace in five years. One reason is an expected surge of new and expensive specialty medications expected to hit the market over the next few years. Another is an anticipated economic recovery, which generally leads an upswing in the consumption of non-urgent medical services. Gating, reference-based pricing, and unitized pricing are all examples of what Aon Hewitt calls a shift in employers’ approach to funding health care benefits. Under the traditional defined-benefit model, the employer risks blowing its budget in a year when its health care costs are greater than expected. If a company thinks costs are going to rise by 5%, it might put 1% of that on the employees and budget for the other 4%. But if costs actually spike by 8%, the company is on the hook for that volatility. But under the increasingly in vogue “defined-commitment” model, as Aon Hewitt calls it, the employer transparently sets limits on its costs. Employees who want richer benefit options have to pay for them or earn them by getting healthier. At the same time, the employer commits to spending a defined amount on employees’ health, like financial incentives for wellness-program participation and other health-improvement activities. There may still be unforeseen cost increases, but the employer can offload much of that risk with stop-loss insurance or reinsurance, or by using a fully insured private exchange like the one Aon Hewitt offers. According to the survey, 77% of companies base their health-plan contributions solely on plan costs, while 16% said the subsidy is a fixed dollar amount. Over the next three to five years, however, those numbers are expected to shift to 57% and 37%, respectively. 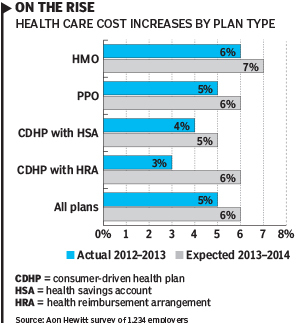 The cost-saving vehicle of choice for a growing majority of companies in recent years has been consumer-directed health plans (CDHPs), an umbrella term for high-deductible plans tied to HSAs or health reimbursement arrangements. But what’s changing is the prevalence of employers making such a plan the only one available to employees. In the Aon Hewitt survey, while just 15% have settled on such a “full replacement” plan today, 57% plan to do so within five years. In a recent survey of 136 employer members of the National Business Group on Health, 29% identified full-replacement CDHPs as the most effective tactic for controlling health costs. That was the highest response among more than a dozen possible answers. Second on the list, at 17%, was offering a CDHP as an option. According to the NBGH’s data, the proportion of its members with a full-replacement CDHP hovered around 20% from 2011 through 2014 but will jump to 32% next year. David McCann is a deputy editor at CFO. In the lifecycles of politics generally and the politics of health care in particular, 2018 seems far away. That’s when companies whose health plans are valued at more than $10,200 per year for individuals and $27,500 for families will be subject to a 40% excise tax on the amount over those thresholds. So why are companies already hard at work toward the goal of avoiding the tax—eliminating high-cost plans, increasing employee cost-sharing, and more (see chart)? 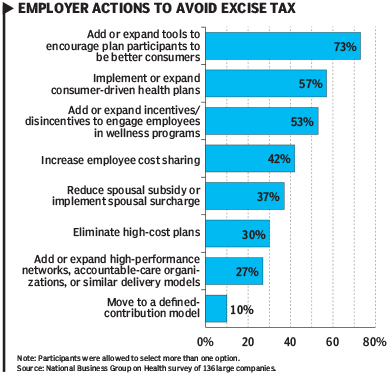 For one reason, some of these efforts take time to implement and generate positive change, says Karen Marlo of the National Business Group on Health, which surveyed 136 large companies on their actions to avoid the excise tax. For another, after 2018 the triggering thresholds are slated to rise in tandem with the U.S. inflation rate, even though medical inflation has been multiple times greater than general inflation for many years and may continue so indefinitely. That means virtually every company will trigger the tax at some point. —D.M. Has Mr. Shaffer considered a gate for all illnesses? What if an employee has manic depression… will he test that employee for it and make him/her pay more for health coverage? If not, then targeting only certain groups like smokers might just set his company up for a lawsuit which will cost his company even more.